With better screening and care, more and more patients with cystic fibrosis are surviving in to adulthood. Recognizing the need for pulmonologists to treat and care for adult patients with cystic fibrosis, Pulmonary Associates has recruited Dr. Liao to help fulfill such a need. Dr. Liao is board certified in Internal Medicine and Pediatrics, as well as Pulmonary Disease and Critical Care Medicine. He has experience and special interest in treating adult patients with cystic fibrosis. Dr. Liao works closely with physicians, respiratory therapists, nurses, and nutritionists at the Cystic Fibrosis Center at the Phoenix Children’s Hospital in caring for adult patients with cystic fibrosis. 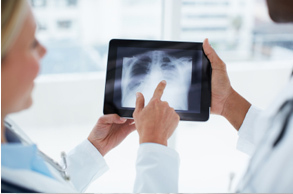 Diagnostic workup for cystic fibrosis is performed at both Pulmonary Associates and Phoenix Children’s Hospital. While not a cystic fibrosis center, pulmonary care for adults with cystic fibrosis is routinely provided at the Pulmonary Associates clinic. For those patients who require more intensive therapy, they are admitted to Banner Good Samaritan Medical Center where they will be cared for by physicians from Pulmonary Associates and Phoenix Children’s Hospital Cystic Fibrosis Center on a rotating basis.